Prepare the Banana Bread: Preheat oven to 350° F. Line the bottom of a loaf pan or 8" square baking pan (which I used) with parchment paper or spray with non-stick cooking spray. In a blender put in the eggs first, and then add the sugar. Blend for 10 minutes on low speed. It should be light, fluffy and a light lemon color (whisk if you don’t have a blender). Drizzle in oil, sour cream, and vanilla. Add in one banana and blend until combined. Sift together the flour, baking soda, cinnamon and salt. Add in the other mashed bananas and nuts; gently combine. Fold in the blender mixture and gently stir all the ingredients together. Do not over mix. Pour half of the banana bread batter into the bottom of your prepared pan. Make the cream cheese layer: In a medium sized bowl, beat the cream cheese and sugar with an electric mixer, until combined. Add in the egg and vanilla and mix until smooth, scraping the sides of the bowl as necessary. Finally, mix in the flour and stir just until combined. Evenly spread the cream cheese mixture on top of the batter in the pan. 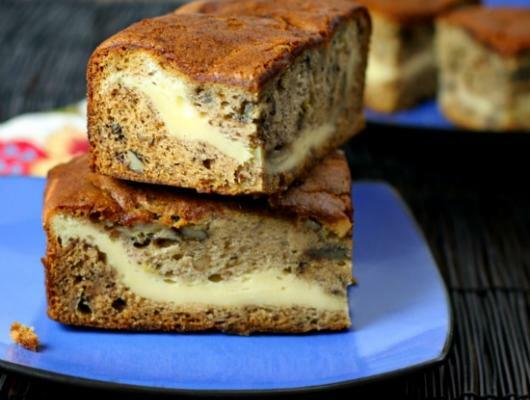 Spread the remaining banana bread batter on top of the cream cheese mixture. Bake for about 50-60 minutes until the center of the bread is set. If the bread is browning too quickly, tent the pan with aluminum foil. Allow the bread to cool in the pan for 20-30 minutes before removing. Slice and serve. Enjoy! 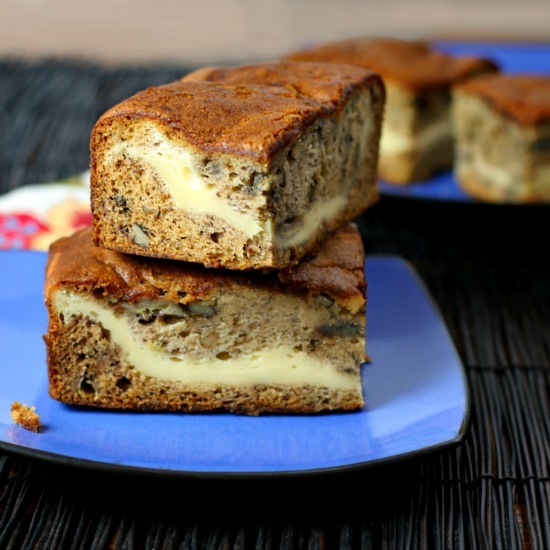 Everyone asks for this amazing, delicious and rich Cheesecake Stuffed Banana Bread dessert & breakfast recipe. A decadent cream cheese layer is baked into every scrumptious bite. Make in the blender!